Does research on modular prefabricated systems allows to go beyond the traditional framework of the family house ? The principle is based on the concept of assembly of prefabricated modules. Initially, each module is manufactured by assembling basic elements (floors, walls, roofs …). All modules are square and allow the nesting of modules in 3 dimensions. In a second step, the combination of these modules allows you to create different types of individual housing. 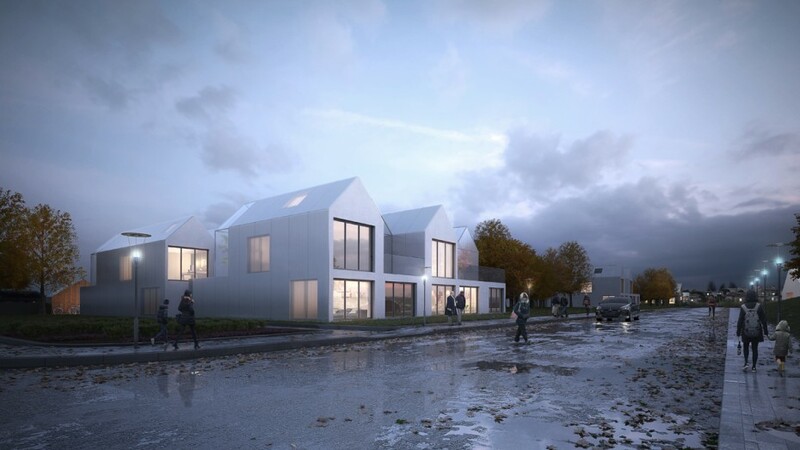 Finally, the assembly of the modules together allows the creation of small collective housing. From a very simple geometry, this system offers the possibility of stacking (up to 2 or 3 levels) and allows almost infinite typological variations. A semi-trailer truck can carry up to 3 modules, so this is the minimum dwelling unit that could be prefabricated in the factory. The assembly of these units is then done on-site depending on the housing typologies specified by the developer and the particularities of the land. In order to better control the cost of installation of technical items (wet rooms, kitchens, stairs, cupboards …), we offer a series of identical basic elements all located in one area : a “technical stripe”, integrated to each unit at the factory on the principle of a fully plug and play system. A range of complementary products could be considered to broaden the possibilities for customization. In our proposal we have for example included greenhouses’ extensions ; a half module made of glass that acts as a thermal regulator. Extension of the house in the winter or broader terrace in the summer. Our proposal for the 3 plots (POS 10 POS 11 POS 12), namely the maximum densification under the local development plan while maintaining individual housing typologies. – The release of the surface of neighboring plots to allow the introduction of new equipment for the neighborhood, larger green spaces, or implement renewable energy systems. All in all, passing from 33 homes on Ülenurme’s development area (required assignment) to 58 homes on only 3 plots, the whole project allows higher profitability of the land together with a socially and energetically responsible development.